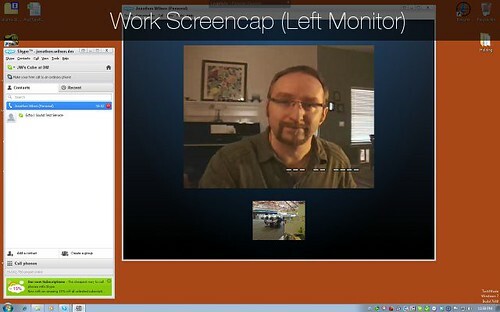 I’ve talked about telepresence/virtual presence before on this blog. Both terms refer primarily to use of technologies that allow “a person to feel as if they were present, to give the appearance that they were present, or to have an effect, via telerobotics, at a place other than their true location” (Wikipedia). 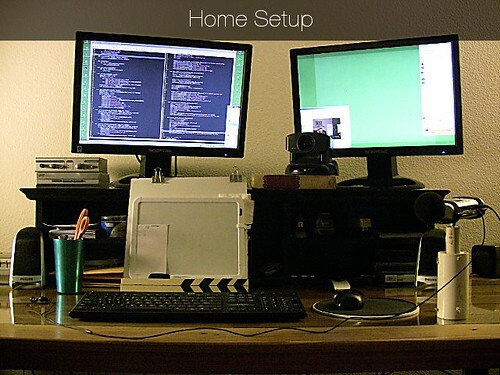 Jonathon Wilson is a software engineer in Austin, TX, USA and has created his own virtual presence set up. He’s been kind enough to write up the details and share them with Ramblings. Jonathon creates video piano lessons in his spare time and more information is available on him at www.groovewindow.com. You can also email him at jonathon@groovewindow.com. As most remote workers know, there is more than one way to work remotely. Combining technologies in a way that fits the working environment is part of making the arrangement work. Before describing what I ended up using, here is a quick overview of the dynamics of my job. I work for the research and development group in a large internet content company. My managers consist of a taskmaster, a product market researcher and a traditional marketer. My coworkers include software engineers, graphic designers and writers. We’re usually working on prototypes, data analysis, and presentation materials demonstrating our findings. I work in a cluster of cubes with other software engineers. There is a fair bit of “cube chatter” as the engineers ask questions and discuss solutions for new projects. The managers generally come over to our cube cluster to discuss what they need: The task master will discuss priority changes and status. 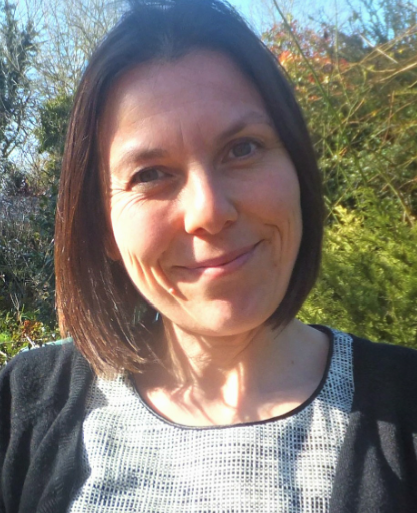 Our marketing manager comes to us with data requests for inclusion in her materials, and the market researcher comes over for technical questions and idea sounding. It’s fairly chaotic, with frequent changes in priorities, and focus shifts. Things that were critical yesterday will often take a back-burner to today’s new requests. Workers and managers alike are stretched pretty thin, and struggle to meet changing deadlines. The group has a flexible mindset, and workers are free to set their own hours and work from home if needed as long as work is getting done. That being said, nearly all of the communication happens in the physical space around my cluster of cubes, and people who are not physically present are generally omitted from the conversations. Instant messaging, email and phone calls are used sometimes to reach out to people who are not on site, but people who aren’t in the office generally miss a lot. I only work remotely about half of the time, so I have a real cube in the office which is right in the middle of things. The chaos of my group means that people don’t have time to change their existing habits or learn new technologies simply to facilitate remote workers. I strongly feel that the person working remotely owns the responsibility to make it work. I wanted a solution which would let my coworkers and managers interact with me the same way, regardless of whether I was in the office. Ideally, I would be the only one making changes to the way I work. I created an additional work Skype account and log into it from my work computer, which has a high-quality webcam. That work account only has one contact: my other Skype account, and it is configured to auto-answer with video whenever I call. This allows my entire team to continue to work with me just as they always have. They can glance at my cube to see if I’m available or not, and I’m able to hear and contribute to informal conversations. Others can visit me in my cube regardless of whether I’m physically there, or “virtually” there. The position of my home Skype window is actually quite important. It’s in the lower-left corner of my right-monitor, which places it directly behind my camera (see the “Home Setup” picture above). This lets people interacting with me feel like I’m making eye contact with them because I’m looking very near to the camera while I’m conversing. 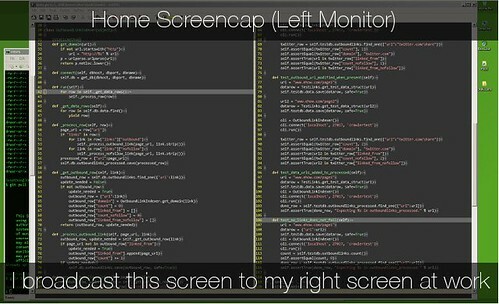 I also use a tool called VNC to broadcast my home computer screen to my work screen. This way, people can look at my cube to not only see my face, but also see what I’m working on. I can show other engineers code, and review priority lists with managers just as if I were there showing them files on my work computer. 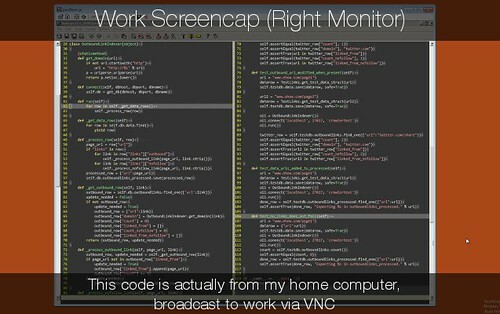 Some people are concerned about security with VNC. However, I make this connection using an encrypted tunnel to my work computer, which I can only make when I’m connected to my work’s virtual private network. There’s an industry term for this remote approach: “Virtual Presence” and there are a several commercially-available solutions. I’ve seen interesting videos of people attaching monitors and cameras to robots so that they could physically move around at work. I’ve been working this way for over a year now, and for most day-to-day work, it’s almost as good as being there. Specifically, I hear all of the normal communication, and people are completely comfortable walking up to my cube and talking with me. It’s amazing how valuable it is to be able to hear the informal cube conversations. In my case, much more information passes this way than traditional meetings. It’s completely obvious to the other people in my office when I’m “at work” and what I’m working on. All of those nagging little questions that managers have about remote workers — wondering if they’re actually working — are completely non-issues with me. They glance at my cube (just as they would if I were physically present) and see whether I’m there or not, and can see what’s on my screen if they’re interested. This approach is essentially free, aside from normal internet bandwidth and the purchase of two relatively inexpensive webcams (around $80 USD a piece these days). While I currently use dual monitors at both work and home, I’ve done this with one monitor on both ends without any problems. Standard meetings (somewhere other than my cube cluster) are still problematic. When I’m remote, I have to do the normal dial-in to an audio conference with all of its inherent problems. Thankfully, my team doesn’t have many sit-down meetings, so I generally choose my remote days for days without meetings. This could be remedied by using a dedicated netbook for my virtual presence, which someone could just “bring to the meeting” and return once it’s over. Technical issues are occasionally problematic. Network issues at home shut me down completely. If my work setup gets flummoxed, it’s a bit of a pain to connect to my work machine in order to straighten it out. In some cases, the situation cannot be remedied remotely, and I need coworkers to help sort things out on the work computer. In general, these are infrequent and solvable, but they’re still annoying when they happen. Working this way has a time commitment similar to actually being in the office. Some people work remotely specifically because they need more flexibility all day long, and don’t want to be tethered to their computer. For those people, this solution will be frustrating. Personally, I like it because it helps the rest of my team easily see that I’m working, and it firmly defines when I’m working from home and when I’m not. This improves my family life, because it’s more clear for everyone where the work/home lines are drawn. Although this solution doesn’t require my coworkers to make any changes, this is also a drawback, because they don’t learn about other possibilities. For example, If more of my coworkers were on Skype, it would be much easier to have a conversation with them without forcing them to walk over to my cube. As I mentioned in the beginning of this article, this solution is custom tailored to my work environment. The chances that it will exactly fit yours are close to zero. Of course, that will be true for nearly any remote working solution. Every environment is different and having a number of tricks in your tool chest can help you be more successful by combining different techniques. Given the low-cost, this approach could be used for shorter sessions. Setting up “office hours” for a couple hours each day could help connect you to your team without requiring you to be connected all day long. It doesn’t require an entire cube or dedicated office. 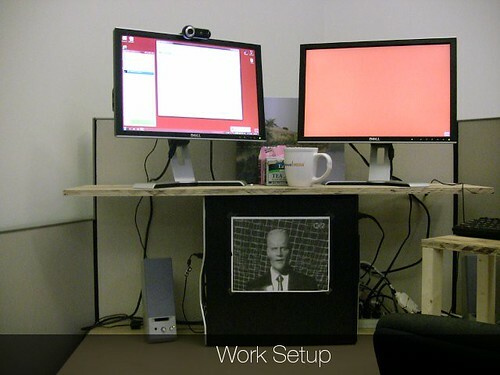 We temporarily setup a part-time remote worker by simply giving him a station on the corner of someone else’s desk. It worked fine, without requiring much space. Use good lighting. Despite advances in webcam technology, every camera relies on good light to create a reasonable picture. When I work remotely, I use a bright work light (with a diffused screen) to light my home space better. I want my coworkers to easily see me, and I’m careful to cover any windows behind me and create a nicely lit working space. Look at the camera. I place my home camera in front of the monitor I use, with the view of my work office in a window directly behind and above the camera. This allows me to essentially have eye-contact with the people I’m talking to. It’s a subtle thing, but it really helps people feel more “normal” when you appear to be looking them in the eye when you speak to them. 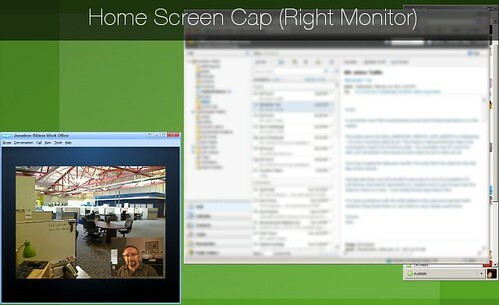 I hope you’ve enjoyed this overview of using Skype and VNC to create a “virtual presence” at work. I’m always happy to talk with other remote workers, so if you have any specific questions, feel free to contact me. Hopefully you can adapt these techniques in appropriate situations to make your remote working a more successful experience! The defining feature of these technologies is that they are sense driven. This means that the user should be provided with lots of stimuli from the other location to make the experience as real as possible. Information ends up travelling from both directions, from the remote user to the technology and back again. Currently my only experience of telepresence is limited to snippets from the Gadget Show (YouTube video). Recently I stumbled on a reference to it in Scott Hanselman’s blog. Scott is a Principal Program Manager for Microsoft and has been working from home for just over a year now. Scott and his team had a chance to remotely drive/beta-test a Telepresence robot from RoboDynamics, the first company to commercialise an enterprise Robotic Telepresence platform. “.. pretty sweet. They’ve got a 26x Optical Zoom and pan/tilt/zoom on the camera. There’s a screen for your “head” so that folks can recognize you as you wander around. I was able to walk all over their office. The control console includes sonar and bumpers so when I got close to bumping into the fridge in their office kitchen I could “see” the distance to the fridge and avoid it. It’s obvious that there are a myriad of possible applications of these technologies. Commercial companies are already using them and further research will make them mainstream before we know it. There is further information on possible uses on the Telepresence World site. Telepresence has a lot to offer education. The telepresence classroom is something you will no doubt be hearing more about in the future. There is some useful information in the JISC Satellite pilot report, notably in the Satellite applications in education section. It will be a little while before we see ‘Ronnie the robot’ in the UKOLN office or have a telepresence room but it will be great for us remote workers when we do. A telepresence is definitely one step closer to a real presence.